Adilynn and I went to our local library last week and her reaction to being there really gets better each time we visit. She ran (yes...at the library) and squealed with each row she went down. We got to talking with the Children's room coordinator, Ms. Savage, and she told us about the 1,000 Books Before Kindergarten program. Adilynn could read 10 books every night if I would let her and if I could only read that fast. I truly believe that this is because we have been reading to her since the very first days of her life. As an educator, specifically a past first grade teacher, I know how important reading is for all areas of development in all children. 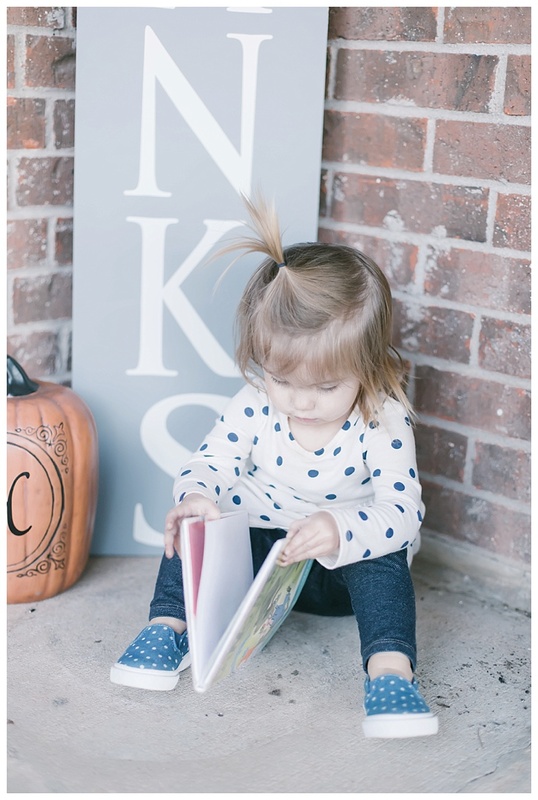 In building vocabulary, reading skills like following along and reading from left to right, and even the handle and care of a book starts at such a young age. I am a reader and I can only hope to instill that in Adi through the years so of course we decided to participate. I love that the library in our little town promotes programs like this in our town to support and encourage the parents of all students. The concept is simple. 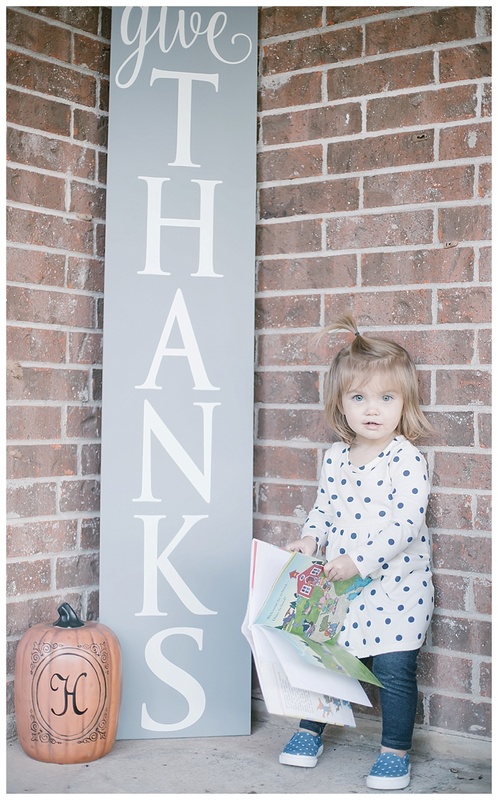 You start reading to your newborn/infant/toddler/student. The goal is to have read 1,000 books before your sweet child starts Kindergarten. Our local library has clear backpacks packed with 10 books for you to check out with various books on various levels. 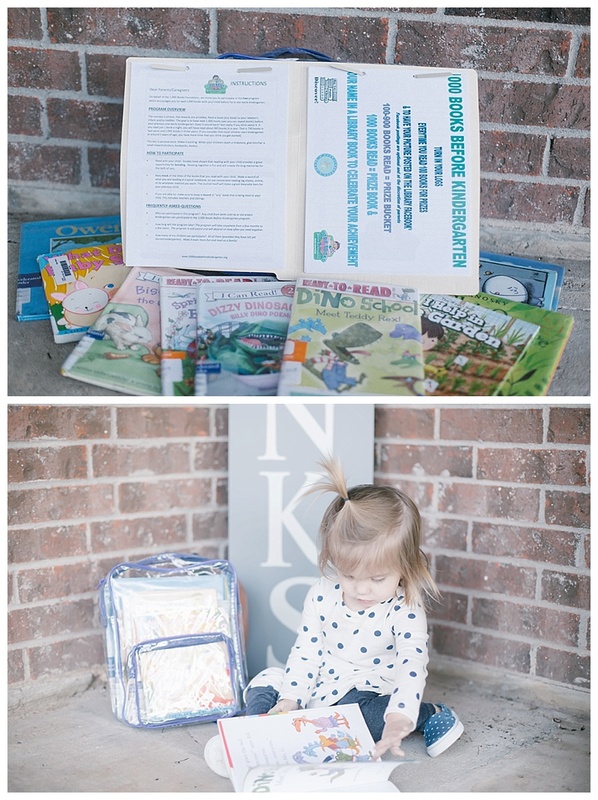 In the folder they give you when your first get ready to start, there is program information, tips for reading with your baby and toddler, and pages with numbers for you to record your books on. Read with your child. It's a simple as that. Spend some time each night reading to them. Keep track of the titles of the books you read with your child on the log provided by the library. Record any and all books read to your student. It can be books that you read, books read to them by a family member, or, as they get older, books they choose to read to you. 1,000 Books read- Prize book and your name in a library book to celebrate your achievement. Adilynn has already chosen her favorite book from her backpack we chose for this week. I read it to her as if I was a dinosaur and she just kept asking for more and more. 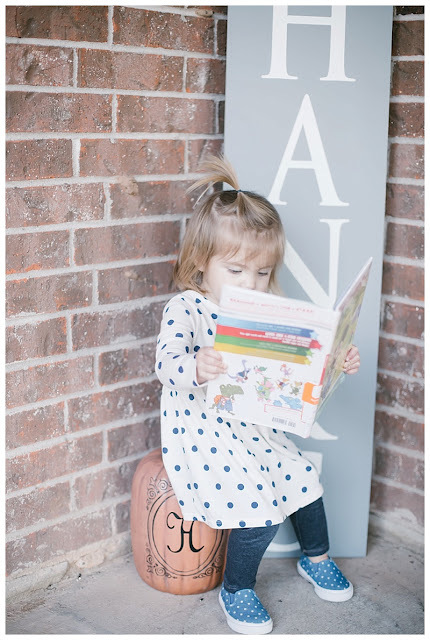 I am excited to see what books we discover and to watch her grow and develop through the exposure to different kinds of literature. I challenge any mommas out there to head to their local library to see if they have more information on the program. If not, you can find more information at www.1000booksbeforekindergarten.org. Happy reading friends! I'm so thankful I wrote down these goals to work towards for the month of September. There is something about holding myself accountable and keeping myself on track. 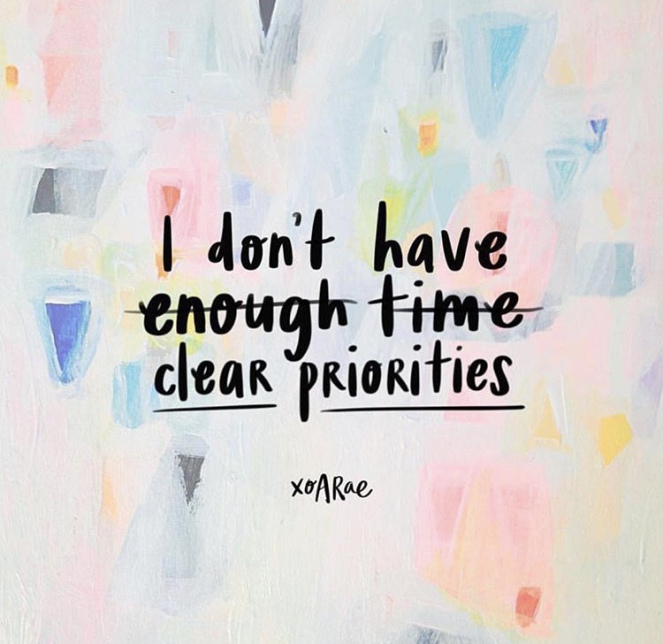 I keep going back to the picture I have on my watch that says "I don't have enough time...clear priorities". I need to continue to work on setting clear priorities and boundaries so that my energy is focused on areas that I want it to be instead of areas that don't deserve the extra energy. At our school, we were trained in a program called Capturing Kid's Hearts. The program is a great restructure of how we deal with situations that arise and I'm looking forward to implementing some of the key parts of the program into family life at home. One of my very favorite is affirmations. Just taking the time to really be intentional about praising the good things that our partners (or in the school setting our students and coworkers) can affect not only their day but yours also. I am working towards being so intentional about giving affirmations to M so that he feels my appreciation for the things that he does to keep me grounded, sane, and serve as my partner. Pretty stinking proud of reaching both of these goals. I ended up having to knock out a 5 mile run to ensure I met the 45 miles on the last day of the month and so Adi and I woke up extra early and made it happen. Proud that I made it and myself a priority. This class y'all. It was a doozy. I could almost swear that I spent upwards of 20 hours a week working on the assignments and getting other things done to be able to pass this class. But I/we made it. It taught me a lot about time management and where my time is wasted. I'm already on week 2 of my next course and I can already tell a huge difference in my stress level and my motivation to stay on top of my work. I just keep telling myself... "two more classes, two more classes". I'm so happy that I have made both of these a priority this year. Guidance lessons with my students give me life. I work at a Pre-K through 5th grade campus with just over 710 students. Its overwhelming to keep myself on track some days but when I get to complete an empathy lesson with 5th graders that blows me out of the water, it makes it all worth it. I read Perfect Courage by Jessica Hon and wow it touched my heart. I love books like that with women I can relate to. I wanted to make sure I was intentional about finishing this book. I'll be sharing a review later next week for anyone who hasn't heard of it or read it. I failed at attending a football game but there is always hope for the next few months ahead. I will say that I'm pretty disappointed in myself for not being intentional with my bible study. Our church even began a bible study class on Sundays and I have yet to attend. I need to set this as a priority and work towards making this a habit. Excited to share more about my October goals tomorrow. Did you set any goals for September that you crossed off? I would love to hear them! When I look at Adilynn, I can't help but imagine all that is in store for her. She seems to grow and learn so much each and every day that each morning she wakes up this totally new person who has precious new tricks to practice and show-off. I envy this about her, as I tend to wake up thinking of all the things that happened yesterday, last week, last month, where she wakes up and is just happy to be ready for another day (as long as mommy gets her milk and muffins for her immediately). I was looking at this photo of the two of us and started thinking about all that she has taught me over the past 20 months and just had to write it all out for the world (me) to read. Let's face it, if we had to learn to walk like babies do, after a few times of falling down, we might just resort ourselves to the fact that we just weren't meant to walk. 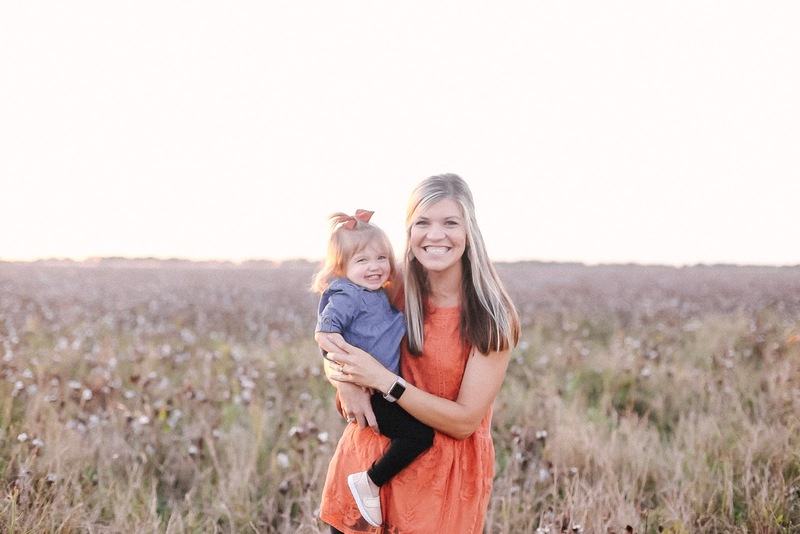 Babies don't understand the complexity that is walking and how much it will impact their life, yet they push through the falls, the aggravation, the frustration to keep trying until they get it. Oh how I wish I had that kind of tenacity. To know that even when failure presents itself that it's not the end all. In fact, it's just part of the stepping stone to being a master in whatever I am working on. If we just listen, we can learn so much. Adilynn copies things that I say, even when I wish she wouldn't. I will find her sitting near me, seeming as though she's not paying attention and then she will either jibber jabber in response to me or repeat words back that I had just said. When I'm talking to her, especially when I say "Adi, listen to mommy" she gives me her undivided attention, looks me in my eyes and just listens. Sometimes, most of the time, people just need us to listen. They don't need our own stories, our opinion, or even thoughts on what they should do. They just need to talk it out with someone who will listen. The fact of the matter is that Adi doesn't care if I knocked out my to do list at work, that I failed in my reaction to a tough situation, or that I didn't go for a run that day. She loves me regardless. She has no expectations for me to be this perfect human-being for her. She just cares that at the end of the day, I walk into that daycare, grab her into my arms and smother her in kisses. She cares that I read her her favorite book at least 5 times a night and that I sing her to sleep every. single. night because she loves me so much. She doesn't love the school counselor me, the wife me, or the friend me. She doesn't care about my failures that I tend to focus on. Instead, she just loves that I'm her momma and that I love her. That should probably have a question mark after it but really....who cares. Why does it matter if you make mistakes? If your opinion isn't the popular opinion? If you aren't the best version of yourself every day? To be honest, babies could care less about any of those things. And ultimately, we (me) as adults need to remember this. All too often, I find myself thinking that people actually care about what I am doing. It's human nature to think that our little lives are bigger than they really are. But in the grand scheme of things, the choices that I make every day should benefit myself and the way that I hope that the man upstairs sees me. I could go on and on, but I'll end there for now. I needed to slow down and remind myself of all that is around me to learn and grow from in the heart of that sweet baby girl who fell asleep to my awful singing and loves me anyways. One of my favorite guidance lessons to go through with my students involves this book. I love getting to read it to them and watch as it slowly clicks on what this book about. After we're done reading it, we talk about how they can be the "ONE" in someone else's life and what that means. I think that part of the reason that I love this lesson so much is because I can think of several people who have been the one for me in my life. Whether it was saving me from making bad choices, picking me up during some of my darkest times, or just standing next to me for support when I didn't even know that I needed it. Those "ones" are more precious to me than anything else in this world. What about you? Who has been "the one" in your life? Has there been someone who has made a difference in your life and helped shape you into who you are today? Have you told that person that they have made a difference in your life and how? I can promise you that it will be one of the most powerful and emotional conversations you can have if you take the time to tell that person. One of the many things that I am so thankful my parents did for my siblings and I is that they spent their money taking us on adventures. We didn't have the latest and the greatest of everything but we have memories that will forever last us a lifetime. I think that this is part of the reason that I have a travel bug and love to explore new places. When I think of all the places I want to visit, it makes me excited for all that is still left in life to experience. Here are just a few that have been on my mind lately. The funny thing about this is that I've actually been to D.C twice already. Once when I was in 8th grade for a trip with my school and once to celebrate the 4th of July. I think if I had the chance, I would go back and do the exact tours and itinerary that we used for my 8th grade trip. I loved the museums and the sequence that we saw them in. I am hoping they have something like this for when I do finally get another chance to visit. This goes without saying. I feel like Nashville is just a staple in the US and a must visit for any and all country music fans. It would make it better if Cody Johnson were playing the same time that we went. I do enjoy me some country music and being able to experience it there would be amazing. Michael took me on my first ever ski trip the first Christmas that we were together and I have been hooked ever since. We went to Red River so I would love to experience skiing at a resort in Denver and anything else my friends/blog friends suggest. I will make this happen one day. There is no ifs, ands, or buts about that. I think Paris is one of those places that you just have to experience at some point in your life. I can't wait to be wrapped up in the culture, the oldness, the atmosphere. Now if I could just talk Michael into going along with me. There is something so interesting to me about what Australia has to offer. I'm not exactly sure what I would want to do there but I would love to just be able to experience it. Cals, I'm coming for you. The fact that one of my favorite blog friends lives here is a huge reason why I want to go here. Not only to see her (although lets be honest, that is really my main reason for adding this to my list) but I would love to experience the South Africa that she knows and loves. It makes me excited that for some of these trips, I will get to take Adilynn along and allow her the opportunity to experience adventure the way that I as able to. Is there anywhere else that you think I must visit? Tell me some of your places you are looking forward to visiting one day.